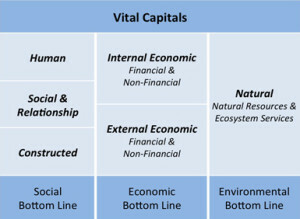 If we can say that the world’s prevailing economic doctrine (capitalism) largely boils down to prioritizing impacts on only one type of capital (economic) with shareholder well-being in mind – and we think we can – the time has come for a new form of commerce in which performance is assessed in terms of impacts on multiple forms of capital and with stakeholder well-being in mind. Monocapitalism, that is, must give way to multicapitalism! 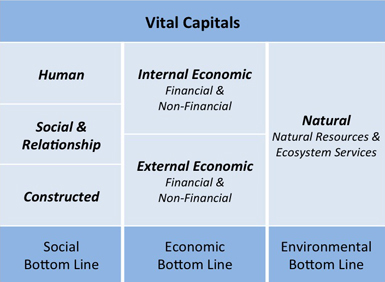 Capital theory in the sustainability and economics literatures expresses the view that there are five broad categories of capital: natural, human, social & relationship, constructed and economic. Included in economic capital is financial or monetary capital; and included in human, social & relationship, constructed and non-financial economic capitals is intellectual capital. Organizational performance, then, can and should be thought of in terms of impacts on all vital capitals relative to norms, standards or thresholds for what they would have to be in order to be sustainable. Value, it turns out, is by no means restricted to economic assets. As a doctrine, multicapitalism is the evolutionary result of Context-Based Sustainability (CBS), a methodology initially devised for non-financial management only. What’s new and exciting about multicapitalism, therefore, is its extension of CBS into the financial domain and to organizational performance more broadly construed. Multicapitalism, that is, finally makes integrated Triple Bottom Line management possible. This changes everything. To help address the challenge of operationalizing multicapitalism in business, we are also pleased to announce our support for the world’s first integrated context-based methodology for measuring, managing and reporting the performance of organizations in a way that takes impacts on all vital capitals fully into account: the MultiCapital Scorecard™. If there are twenty-five things that have to happen in order to make the New Economics possible, this is certainly one of them!